To Score really well, it is better to invest highly in one area than to spread yourself across many. My strategy for this is to “fish” for the first few rounds by dumping off low/middle cards in colours I think I will not be working with. If my opponent “bites” and picks up a colour, I know to not play that colour and I can also try to dump that colour in hopes that she (it’s usually my wife that I’m facing) will waste time picking those small cards up. If I have an investment card in that colour, I will usually hold it back, just so she doesn’t get it! Yeah, all’s fair in love and war (and Lost Cities, apparently!). The first few times I played, I waited to play my higher cards, holding out to get lower cards, 2s-5s, because hey, I wouldn’t be able to play them later. I lost a few games because of it before I learned that waiting on low cards isn’t worth not playing/discarding high cards. If you have them, play them, if you have 20+ points in higher cards, move on. Always keep in the back of your mind the big payoff for 8 or more cards in stack that can payoff big time! The 20 point bonus is very nice. This usually works better with at least a couple of investment cards put in there. Of course, it’s risky trying to find that 8th card sometimes that you need, and you may have to go ahead a finish the expedition(stack) without. Most people seem to advise you to concentrate on a few expeditions and that is solid advice particularly when it leads to the 20 point bonus. However, what should you do while you are amassing that 8 card run? Essentially, you have only two options but I think too many people chose the wrong one. Your two options are to discard to the middle mediocre cards or play the mediocre cards you have in your hand. I suggest you almost always play them. Too often people discard hoping to get cards back but this just allows your opponent to make that 8 card run by picking up your discards in the middle. I think you can defend against this by starting expeditions that you don’t expect to make many points on or you even expect to lose a few. I would argue that gaining a few points (or even losing a few) is ultimately a better strategy than discarding to the middle which allows your opponent to get your cards. Which cards am I am talking about? Probably anything that is a five or over but at times I’ll start lower than that. In other words, if I have three cards of middling value I’m going to play them down because I’m rarely going to lose many points on the venture. Typically, through what you are already holding and just the natural draw you can get three or four cards that will get you to twenty which makes you safe. By playing them down you are not gumming up your hand nor are you allowing your opponent to have access to them. In other words, while I agree you want to concentrate your efforts on just a couple of colors, I still typically start at least four of the adventures and frequently five. By putting down some middling cards early, I don’t gum up my hand and I cause my opponent not to want to start in that color either. If my opponent has a high card or two for that color this will also gum up their hand for the whole game as they don’t want to start an adventure in that color but they can’t discard the card either. Sometimes of course I will start a color too early and not be able to take advantage of a good draw in that color but that is always a danger in the game regardless of strategy. Playing colors as soon as you are reasonably sure you won’t take a big hit though, ultimately leads to a quicker game which does not allow your opponent time to adjust. Keep concentrating on big scores in one or two colors but go on (almost) every adventure (even if you only get to play a few cards) and see if that doesn’t work more often than not. It’s tempting to wait until you get that 6 before putting down the 7, but as the draw pile get’s lower, it’s not going to be worth waiting for. If you need more time, start drawing useless cards from the discards, but that draw pile is an hourglass and when it’s gone your time is up! Set up the board in front of you, and shuffle the cards as normal. Deal yourself eight cards, then place the draw deck face down. Place or discard one card from your hand, then take a card from the draw deck. Next take the top card from the draw pile, and without looking at it, place it in a separate discard pile. Use a coin or other two sided object to mark alternating turns. Then complete your turn again, and flip the marker. Now take a card from the draw deck, look at it, and place it face up on the board on its matching colored discard area. Then repeat the process until the draw deck is exhausted. Total your score, and keep trying for higher scores. Be careful about playing many expeditions. Only play 2 or 3 unless you are getting really good cards. Same with investments. Don’t take big risks or else you’ll end up far in the negatives. For some more tension, add a play clock for turn times. Also helps move the game along if you partner is prone to analysis paralysis. Don’t be tricked into starting an expedition with a bunch of small value cards. The important ones are the high values: the heavy hitters. At the start of the round, I would recommend giving your partner your highest valued cards. This allows you and your partner to identify which colors to go after. 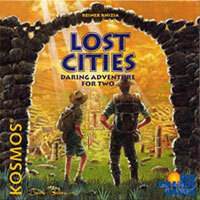 When I began playing Lost Cities, I found that I often had low or negative scores. So I changed the scoring system a bit. The rules state that you should deduct 20 points for each expedition started, then use the bonus multipliers (2x, 3x, and 4x) for the “handshake cards”. So, if you have an expedition with cards totaling 9, you deduct 20, leaving -11. If you had played two handshake cards, the rule say multiply your -11 time three. That’s -33; Yikes! My scoring variant is to take the multiplier bonus before subtracting 20 for the expedition. Then the scenario above would give 9 times three (handshake bonus) for 27 points. Then, deduct the 20 points for the expedition for a net value of 7 points. That makes for a 40 point swing from the -33 in the first example. My scores are higher, and I don’t have to deal with negative numbers in final scoring.